Somebody (I’m sure it was someone important) once said that you should pick your battles wisely. I’ve been more or less following this since I realised that I don’t need to be the best in everything. So I put my knitting to a side for a moment, and fought battles with the mother of all sciences, mathematics. I won, if you’re keeping score, and I’m back. I have however failed my first ever battle with knitting. Generally considering myself a learner, I always try new tricks and techniques. Because I’ve been only knitting since October last year, when I pick up a project, there is bound to be something I’ve never done before. Couple of weeks ago I decided to put this beauty to test and casted on Daybreak Shawl. I never knitted a shawl before, but a few chocolate bars and a thousand of videos later, it’s progressing very nicely, thank you. My first every pair of mittens was knitted flat because I was scared for my life dpns. Never mind the fact, that in my genius I cut a normal pair of circular needles and tried to sellotape it together to create a circular needle of such a small diameter. Epic fail. I’ve faced my monsters and in the last month I whipped up TWO pairs of mittens using 2.75mm dpn. And I enjoyed it. So you get the point, I don’t give up so easily. Until I started working on Witterings. The hat itself was a pleasure to work on, it was very easy and memorable pattern that didn’t require much technique apart from knitting and kfb, which I despite, but can master. I should have known better, really. 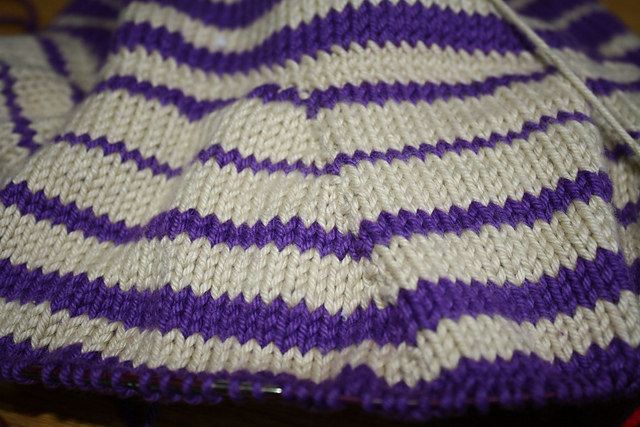 All going well, you finish the brim and then knit-front-back into every stitch. I should have heard alarm bells ringing at this point. Surely you don’t double the number of stitches for easy-peasy cast off right? Never mind, I continued knitting one and slipping the other stitch like a faithful knitter. Then, after even more bars of chocolate I got to the actual cast off, googled tubular cast off and started working.... if you can call that. It was a disaster. My stitches were so uneven that I looked like the kitty had my Witterings for breakfast and then returned them via upper digestive system. Not pretty. I’m going to thread brim wire at this point, and then do the k2tog bind off. So bind off 2 stitches, cast off another 2 stitches, pass over, k2tog, pass over... etc. Works like magic, although there are over 500 stitches there so you may need to wait for a FO photo a little longer. And while on the subject of Witterings, I was failed by Ravelry too. 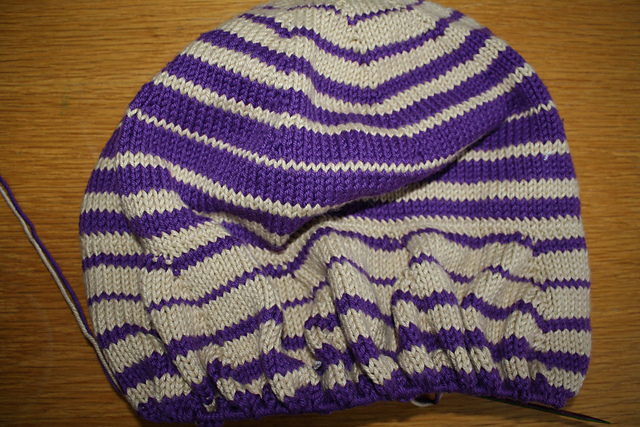 I wanted my hat to be one colour only because it would look neater, but I only had scraps of Rowan Handknit Cotton. Checking patterns projects, it looked like I will need 2 skeins of each colour I wanted to use, so 4 skeins in total. I had 3 and a half, so I didn’t want to risk it. I came up with this idea of decreasing-increasing stripes. All good, but I’m on the bind off part now and I’ve only used 1 skein in Line and nearly 2 skeins of Decadent (purple). So I would have been fine if I wanted to knit my hat in all purple. I may make another one some other day, when “tubular cast off” doesn’t send me running away. 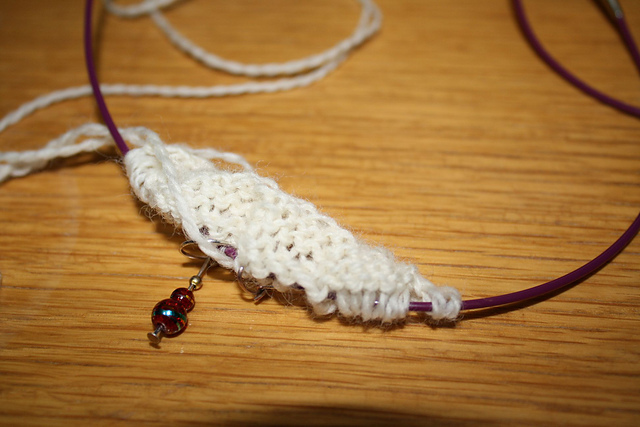 So, what’s your oh-no-can’t-possibly-do-it aspect of knitting? I've been knitting since November last year, and like you I just seem to go for it. Tubular cast on/off and provisional cast ons I still haven't got to grips with though! Cant waite, to she that shawl grow! that yarn looked mouth watering! !